Vegetable growers will find a great selection of tomatoes and peppers (sweet and hot), along with eggplants, Asian greens, summer and winter squashes, pumpkins, lettuces, salad mix, a wide variety of basil, cucumbers, kale, and more. Flower lovers can choose from an array of annuals perfect for homegrown bouquets and landscape plantings. With winter rains and April showers greening yards and moistening garden beds, the UC Santa Cruz Farm & Garden’s spring plant sale comes at the perfect time. Gardeners can choose from the region’s largest collection of organically grown vegetable, herb, and flower starts along with a wide variety of landscape plants. The sale takes place Saturday, April 30, and Sunday, May 1, in the Barn Theater parking lot at the base of the UCSC campus, near the intersection of Bay and High streets in Santa Cruz. The sale will be open on Saturday from 10 a.m. to 3 p.m., and on Sunday from 10 a.m. to 2 p.m. On Saturday, members of the Friends of the Farm & Garden can enjoy a “members’ hour” starting at 9 a.m. (New memberships and renewals are available starting at 8:30 a.m.) The sale also hosts a free seed exchange sponsored by UCSC’s Demeter Seed Library, and an educational exhibit and talk on indigenous plant names and sources starting at 11 a.m. on Saturday. For vegetable growers, this spring’s sale will feature a great selection of tomatoes and peppers (sweet and hot), along with eggplants, Asian greens, summer and winter squashes, pumpkins, lettuces, salad mix, a wide variety of basil, cucumbers, kale, and more. Flower lovers can choose from an array of annuals perfect for homegrown bouquets and landscape plantings. This year’s offerings include asters, bachelor’s buttons, hollyhocks, stock, zinnias, and five varieties of sunflowers. Also available are particularly water-thrifty options, including amaranth, poppies, marigolds, snapdragons, statice, strawflowers, and cosmos. Tomatoes are always a popular sale feature, and this year’s collection includes a wide variety of cherry, heirloom, slicer, and paste types selected to fit the region’s various microclimates, from cool coastal settings to hotter inland sites. Among the offerings, look for ‘Blush’, ‘Camp Joy Cherry’, ‘Chadwick Cherry’, ‘Persimmon’, ‘Rainbow’s End’, ‘Red Brandywine’, ‘Sungold’, ‘Yellow Pear’, ‘San Marzano’, ‘Principe Borghese’, ‘Speckled Roman’, ‘New Girl’, ‘Valley Girl’, ‘Pruden's Purple’, ‘Oregon Spring’, ‘Marvel Striped’, ‘Cherokee Purple’, and ‘Paul Robeson’. This year’s sale features a large assortment of perennials chosen for their proven performance in the Monterey Bay region. Among the favorites are salvias, lavenders, and rosemary and marjoram varieties, butterfly bush, delphiniums, coral bells, Ribes, and gerbera daisies, along with Peruvian lilies and yarrows in a range of colors. Fig trees, blackberries, and raspberries will also be available. Many of the perennials will be priced at a special rate of three for $20 in gallon containers. UCSC’s Demeter Seed Library will host its quarterly free seed exchange Saturday and Sunday from 10 a.m. to 2 p.m. Free open-pollinated and heirloom seeds will be available for home garden’s or to share with the library. The spring plant sale benefits the UCSC Farm & Garden Apprenticeship, a six-month training course in organic farming and gardening. 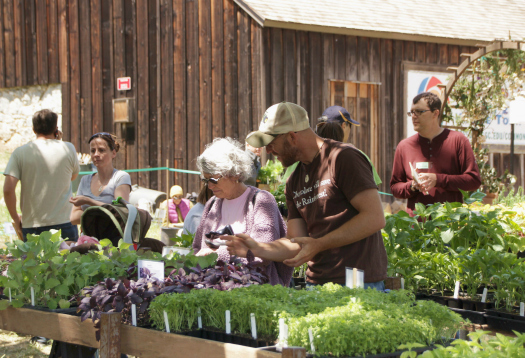 Members of the Friends of the UCSC Farm & Garden receive a 10 percent discount on purchases; memberships will be available at the sale beginning at 8:30 a.m. on Saturday and 10 a.m. on Sunday. Plant purchases and Friends’ memberships will help grow the next generation of organic farmers and gardeners. 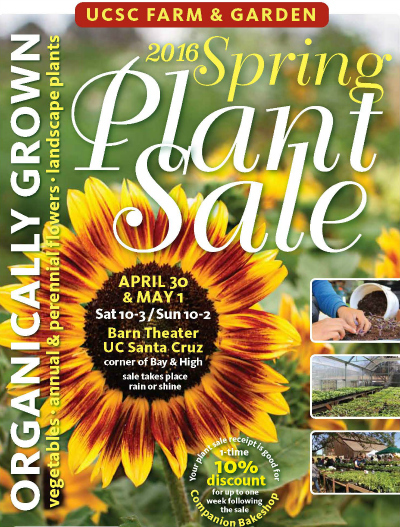 More information about the spring plant sale or the Friends of the UCSC Farm & Garden is available at (831) 459-3240, or by email to casfs@ucsc.edu.